The default TX-Power of wireless is set to 20 dBm but you can increase it with a little trick to 30 dBm but let me warn you first that it might be illegal in your country, so use it at your own risk. Moreover some models will not support these settings or wireless chip may state that it "can" transmit with higher power, but the device's manufacturer probably did not place the appropriate heat sink in order to accomplish this. In different countries, legislation and technical standards varies, including in relation to Wi-Fi. In some countries it is not allowed to use the frequencies of some Wi-Fi channels (for example, channels 12, 13 and 14 can not be used in the USA). In most countries, a Wi-Fi signal power limit of 20.0 dBm is set. But there are countries in which there is a limitation of 30.0 dBm. You can take advantage of this loophole (make your wireless thinks it is located in a country where 30.0 dBm is allowed) and raise its TX Power to a value of 30.0 dBm. Regulatory domains (or "regdomain") is the country in which this device is supposed to work. There is also an accompanying database, in which are prescribed the permitted frequencies and the allowed power. set the increased power for the wireless adapter. driver features, for example, some drivers ignore system settings. This is not an insoluble problem, but each model needs its own approach. You can examine the full current database in pain text here. 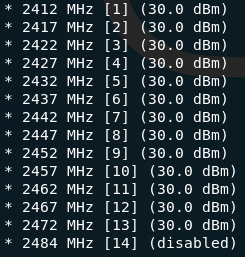 Note that for channels at 5 GHz they have different values (different list of allowed frequencies and powers). 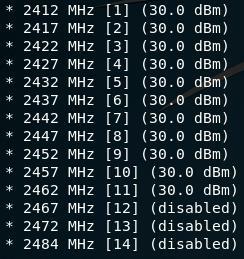 Next, I'll show the power increasing of Alfa AWUS052NH in Kali Linux. The old guides tell to install additional packages, but currently this is not necessary. Everything you need is already available in Kali Linux! The string country 00 indicates that I have not set any value and the default settings was applied. The line txpower 30.00 dBm indicates that we have succeeded. The above commands have no effect for AWUS036NHA . The driver of this adapter ignores regulatory domain value. 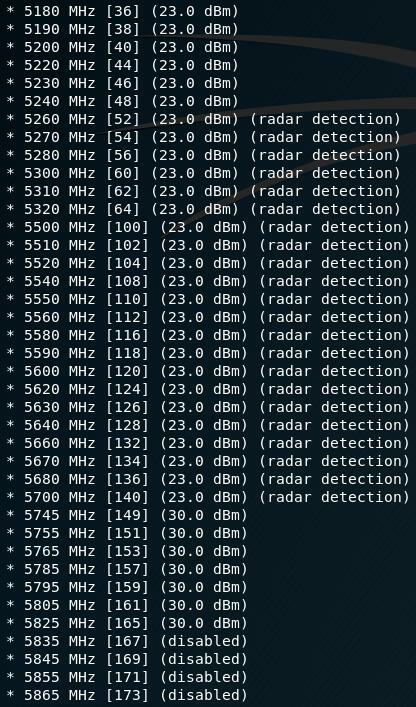 If you have Alfa AWUS036NHA or any other that ignores settings of regulatory domain, this is no reason to give up. We are able to change database of the world regulatory domain. In my case, the country GB line indicates that the adaptor was produced for the country that is named GB in the database. My method differs from other tutorials, where the wireless-regdb and crda packages are manually installed. These packages should already be installed on your system (in Kali Linux is the default). The only thing we do is replace the database file. As a result, a binary file of the database (regulatory.bin) was created from the text file. We will use it to replace the file with the same name in the system. 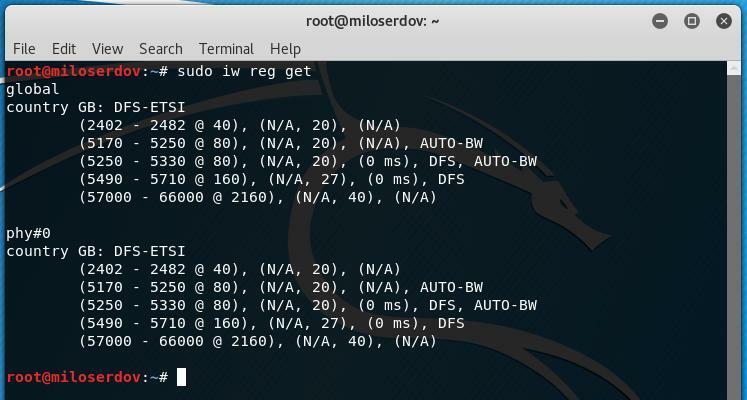 Now do not use sudo iw reg set BZ. mean we are able increasing the power to 30 dBm. After we patched the database, there is no longer any need to change the value of the regulatory domains for any wireless interface! Increasing TX power of the Wi-Fi adapter is undeniably useful only for Wi-Fi jamming, as well as for deauthentication attacks. In all other attacks, increasing TX power would not matter. 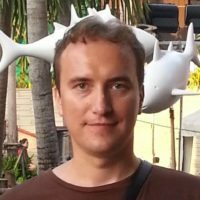 Since power affects how loudly your Wi-Fi adapter is “talking”, but does not increase its sensitivity (how well it ‘hears’ others). Changing value of regulatory domains lets to unlock some channels that might not be available in your country. Hi man.. Thanks for the guide! But I have a problem using the Alfa 036NH. No networks show up after increasing to 30 OR 33dBm. Hello! Unfortunately, I cannot reproduce the bug because I have no Alfa 036NH. I suppose its hardware is restricted with a maximum output power 2000mW. If you need, I can provide for you the guide how to revert made changes. Hey Alex, thanks for the quick reply. Don't worry, I did this on a Virtual Machine which has no value to me. I am not going to try random things on the internet on machines that have high value 😀 I also made a snapshot. I am even more confused now.. I just reinstalled Kali after being completely lost, and without ever touching regions or anything else explained in here, the adapter won't show networks. I got it working again after updating/upgrading, dist upgrade.. Then I rebooted and stopped working again. This is really getting on my nerves 😀 I might just grab an old HDD/SSD and install it on there instead of a Virtual Machine. Oh, totally forgot. 33dBm is equal to 2000mW, is it not? No worries. It's way less worse than simply killing proccesses that interfere with airmon-ng.. I feel so stupid 😀 Never had this problem, EVER. But I think this was the problem. I installed 2017.2 instead of 2017.3 and simply changed region, nothing else. Then I did airmon-ng check kill and that fixed it. I will now test it on the other VM with 2017.3 + updates/upgrades + dist upgrade and will report back. I have UBUNTU 17.10 and a laptop HP with a afla network card. This worked, but it took two days to solve the problem. It was rather odd but it work. The problem was when I was trying to get sudo cp $USER.key.pub.pem /lib/crda/pubkeys/ to work. So what I did was ls and found the root.key.bub.pem copy and the other wone into the crda/pubkeys . Ubunto , did not have it set up from install or not sure why but you get the 00 for country code. Reall problem. the txpower is at 20 by defualt. I don't know why was so difficult to find a working guide for the awus036nha! worked like a charm for kali 2018, thanks! Unfortunately, if I set the txpower to 30 or 33, nothing happens. Changing the region to BO or GY doesn't help either. Any idea? But actually I already change global part to 30db. Hello! It is interesting behavior and I also can reproduce it. But: only if no wireless cards are connected. 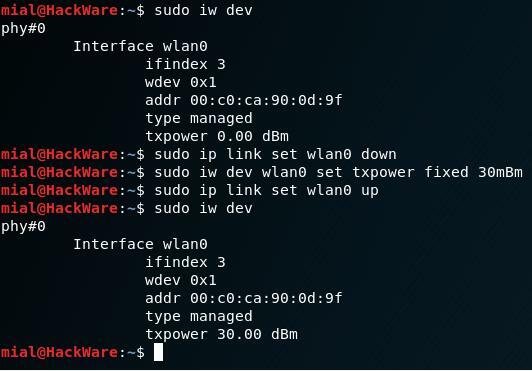 Once I connect a wireless adapter, I get the higher values without necessity to set Regulatory domains explicitly. I guess it is kind of optimization: the system does not load heavy database if there is no real need (no wireless interface). The system is smart! I need to run "iw dev" at least once to keep it persistent on reboot. I tried to disable NetworkManager, but I cannot reproduce the behavior if a wireless card is plugged. Did you make some tunings of your system? fresh kali ova import yesterday. But I commented it, because not everyone needs the monitor mode. So if you need the monitor mode, use the command just above. If you do not need the monitor mode, skip the command.